04 - Natural Selection 04-11 - Divergence of Character 140 As all the modified descendants from a common and widely-diffused species, belonging to a large genus, will tend to partake of the same advantages which made their parent successful in life, they will generally go on multiplying in number as well as diverging in character: this is represente in the diagram by the several divergent branches proceeding from (A). 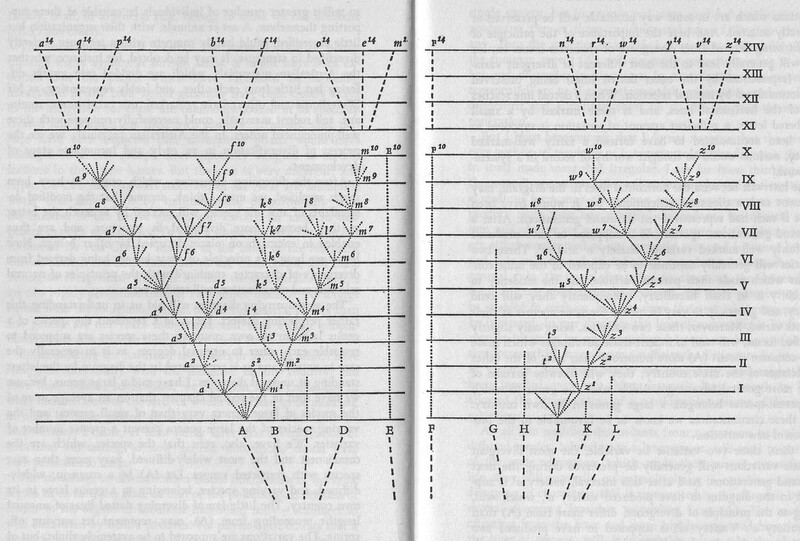 The modified offspring from the later and more highly improved branches in the lines of descent, will, it is probable, often take the place of, and so destroy, the earlier and less improved branches: this is represented in the diagram by some of the lower branches not reaching to the upper horizontal lines. In some cases no doubt the process of modification will be confined to a single line of descent and the number of modified descendants will not be increased; although the amount of divergent modification may have been augmented. This case would be represented in the diagram, if all the lines proceeding from (A) were removed, excepting that from a1 to a10. In the same way the English race-horse and English pointer have apparently both gone on slowly diverging in character from their original stocks, without either having given off any fresh branches or races.